Gerald Govan was born January 2, 1942 in Jersey City. He grew to 6-10 while attending Henry Snyder High School, which was known more for its arts programs than its sports. Snyder is located in the southern section of Jersey City, near Bayonne. Gerald was a strong rebounder and defender. His scoring was hampered by an unorthodox shooting style, which imparted a sideways spin on the ball—and somewhat by poor eyesight. He addressed this problem by wearing thick, black shatterproof glasses. They would become his trademark during a long pro career. In 1960, Gerald accepted a scholarship from St. Mary of the Plains College in Kansas, an NAIA school that shut its doors in the 1990s. Gerald was the Saints’ leading scorer and rebounder. After graduating in 1964, Gerald was the 11th round pick of the St. Louis Hawks in the NBA draft. In camp, he was competing for a roster spot with fellow rookies Paul Silas and John Tresvant and was the odd man out. Gerald got a new lease on his pro career with the formation of the ABA in 1967. He made the New Orleans Buccaneers as a backup center to Red Robbins, and was part of a talent-packed roster coached by Babe McCarthy. Gerald’s teammates in that first ABA campaign included Larry Brown, Doug Moe, Jimmy Jones and Ron Widby. Widby, an All-American in basketball and football, later became a punter for the Dallas Cowboys. Gerald averaged 7.6 rebounds in roughly 20 minutes a game for the Bucs in 1967– 68. New Orleans defeated the Denver Rockets and Dallas Chaparrals to reach the first ABA Finals. They were a hustling team with a great bench, led by Gerald and Jess Branson. Unfortunately, the Bucs ultimately fell to the Pittsburgh Pipers in seven games. Gerald became a full-time starter in 1969–70 and led the Buccaneers in minutes played and was selected to play in the All-Star Game. He averaged 12.5 points and 14.5 rebounds per game, earning a reputation as one of the best power forwards in the ABA. His greatest skill was starting the fast break. Gerald would grab a rebound and already be looking for an outlet man before he hit the ground. 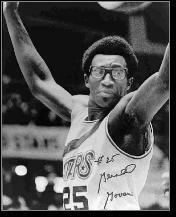 Besides his glasses, what many recall about Gerald was that the red-white-and-blue ABA ball accentuated the odd spin he put on his jumpshot. The team moved up the Mississippi to Memphis in 1970–71 and became the Pros. Gerald went along for the ride and ended up leading the league in minutes played. 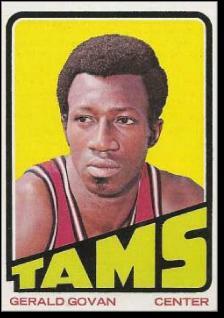 He was also the ABA’s top-rebounding forward. During their two years in Memphis, the Pros were ignored by basketball fans. The franchise went under, and Gerald became the property of the Utah Stars. Gerald’s three seasons in Salt Lake City were very productive. With multiple scoring threats on the Stars’ roster, he could concentrate on rebounding and defense. The Stars finished atop the ABA’s Western Division in Gerald’s first two seasons before going into rebuilding mode in his third. During the 1974–75 season, Gerald—now 33—became the mentor to Utah’s 19-year-old rookie, Moses Malone. Gerald finished his pro career with the Virginia Squires in 1975–76. He was one of only six “survivors” from the ABA’s first campaign. The others were Louie Dampier, Bob Netolicky, Stew Johnson, Byron Beck and Freddie Lewis. Gerald returned to Jersey City after retiring, where most of his family still lives today.